Founded in 1955, Bradley, Drendel & Jeanney is the oldest law firm in Nevada devoted to the litigation and trial of personal injury accident cases. 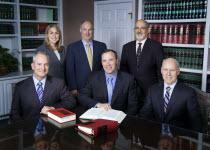 The firm continues to obtain a remarkable level of success in these specialized cases. All of the firm's named partners are native Nevadans. We understand the unique nature of Nevada and the legal environment in our Nevada communities. We have three generations of family firm members and will continue to serve our clients for future generations to come. Through the past five decades, the firm has achieved multi-million dollar jury verdicts and settlements in a wide range of cases including wrongful death, brain injury, dangerous and defective products, air crashes, boating accidents, automobile and trucking collisions, insurance bad faith, negligent litigation, nursing home abuse and a variety of other injury cases. We are AV-Rated Pre-eminent law firm by Martindale-Hubbell, the highest rating a law firm can get in the legal profession as determined by our peers in the profession. The firm's partners have been recognized by their peers and judges by selections of such prestigious legal organizations as the American College of Trial Lawyers, the American Board of Trial Advocates, the Inner Circle of Advocates, Million Dollar Round Table and Litigation Counsel of America. These organizations recognize our firm members as outstanding trial lawyers maintaining a strong and enduring reputation for legal ability and success in the courtroom. We serve clients in the Nevada areas of Reno, Carson City, Elko, and Douglas County, as well as Northern California. 8:30 - 5:00, Monday - Friday. Eve and weekend appts available.